Here is the latest on Florence's lingering impact. The weather service’s office in Wakefield, Virginia, said Wednesday that meteorologists have confirmed two additional tornadoes hit the area on Monday. That brings the total for that day to eight. Amtrak’s Crescent service resumed on Wednesday. Northbound and southbound service through North Carolina will begin early Thursday. Three other trains will resume service through North Carolina on Sunday. They urge residents to remain vigilant as there may be flooding in some areas as waters recede. They’re warning people not to skirt or move barricades as they mark flooded areas and sink holes. Authorities say the mental health patients who drowned in a South Carolina sheriff’s department van were on a court-ordered transport when they were swept off the road by rushing flood waters. North Carolina Gov. Roy Cooper says he plans to hold President Donald Trump to his promise to support North Carolina “100 percent” as the state starts what is expected to be a long recovery from devastation caused by Hurricane Florence. Cooper said he also told Trump that the federal government will have to “take a special approach” to help North Carolina’s farmers because they have “taken a gut punch.” The governor said there are entire farms under water, sweet potato and cotton crops have been destroyed, and significant losses in the pork and poultry industries. North Carolina’s electric cooperatives say they have made substantial progress restoring power knocked out by Hurricane Florence. As North Carolina’s farmers evaluate their crop losses after Hurricane Florence, it looks like damage to tobacco fields and barns could be the most costly. North Carolina is the nation’s top producer of tobacco, which remains one of the most valuable crops for farmers. A South Carolina sheriff says his office is performing an internal investigation into the circumstances surrounding the drownings of two women in a sheriff’s office van who were being brought to a mental health facility. Horry County Sheriff Phillip Thompson says in a statement Wednesday that he’s also cooperating with the State Law Enforcement Division to learn exactly what happened Tuesday night in Marion County. They’ve been using high-water vehicles and other equipment to rescue dozens of people. They’ve also evacuated hundreds of people from homes and buildings. U.S. Northern Command said the troops will stay until they’re no longer needed. Cumberland County Sheriff’s Office says search-and-rescue teams responded late Tuesday to a report of a body just south of Fayetteville. The sheriff’s office told the Fayetteville Observer the teams weren’t able to retrieve the body because the trailer was surrounded by water. But sheriff’s spokesman Lt. Sean Swain told The Associated Press that authorities have not confirmed if the man drowned due to flooding from former Hurricane Florence, or if he died of other causes. Two mental health patients referred to by officials as “detainees” who drowned in the back of a sheriff’s department transport van in South Carolina have no arrest records in the state. That’s according to documents obtained from the State Law Enforcement Division concerning 45-year-old Windy Wenton and 43-year-old Nicolette Green. Horry County Sheriff’s Office spokeswoman Brooke Holden says the pair were in a sheriff’s office transport van Tuesday night when it was swept off a rain-soaked road. The patients’ bodies were being recovered Wednesday morning. 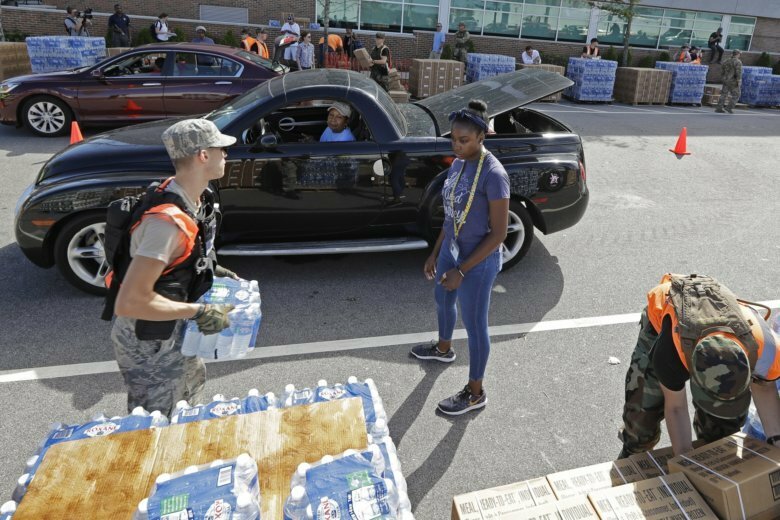 The N.C. Department of Agriculture issued the mortality totals as major flooding continues in the state due to the storm’s drenching rains. Marion County Coroner Jerry Richardson tells The Associated Press that 45-year-old Windy Wenton and 43-year-old Nicolette Green were being transported by a Horry County Sheriff’s Office van between Nichols and Mullins on Tuesday night when the van was swept away by rising waters. Two deputies were rescued from the top of the van, and Horry County officials say they tried to get the women out. Richardson says the patients’ bodies were being recovered Wednesday morning.